Twin Cities Wine Education is proud to present a night of rarities, gems, and outstanding discussion with one of the new stars of the Sonoma wine business. This will be a special night indeed. 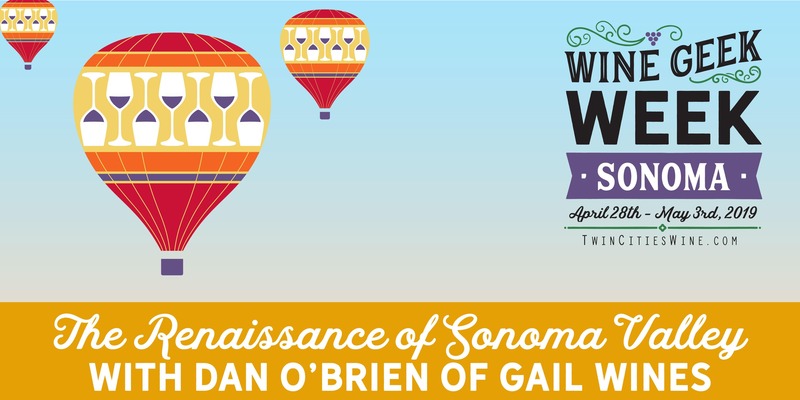 Dan O’Brien is part of the young new guard of the Sonoma wine scene, producing an uber-limited and much sought after wine called Gail Wines. In this special night, Dan will not only present his gems (a rarity indeed!) but also lead us through a tasting of significant producers in the Sonoma Valley AVA. He will also help us detail the appellation itself, learning how best to visit the region and get the most out of your wine dollar. The list of wines has not yet been finalized and will compose of six incredible selections plus wines from Dan’s own label. Under consideration (we’re working on securing the products right now) are wines such as Scribe Estate Riesling, Gail “Chuy” Chardonnay, Arnot Roberts “Old Vine” White Wine, 1992 Ravenswood Sangiacomo Merlot, Bedrock “Monticello” Cabernet Sauvignon, and more. Very limited seating (24 seats) for this special event. Hear more about Dan on the Cru Podcast. Read more about Dan at Slow Living Radio. Learn more about Gail Wines at their website.